Spectacular Contemporary Mountain Home Awaits You! 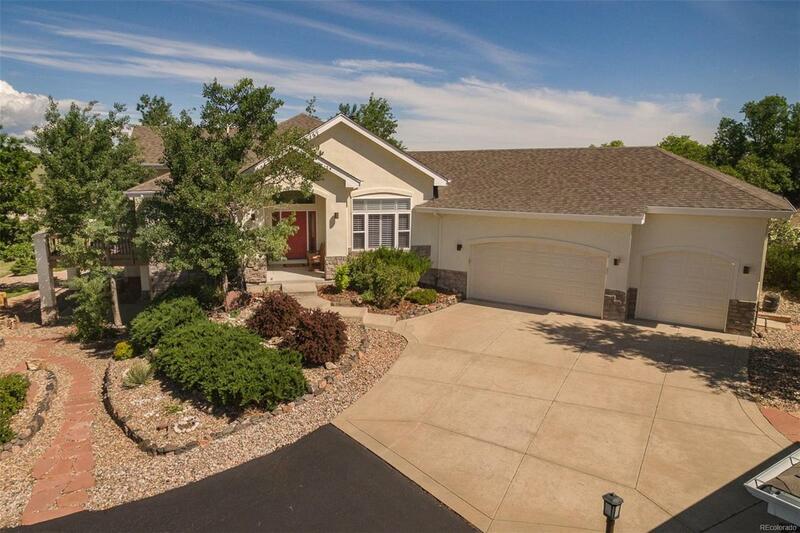 This custom home is nestled amongst the rolling hills on over 5 acres w/stunning western-facing mountain & valley views from both decks & both patios in a peaceful country setting! Grand entry foyer leads to formal dining rm & executive office w/walkout to deck - Great rm w/custom floor to ceiling rock fireplace & deck - Hearth family rm w/built ins & fireplace adjacent to chef's delight gourmet kitchen w/sueded slab granite counters, knotty cherry cabinetry, 2 furniture style islands, Wolf 5 burner gas cook top, double ovens, drawer-style microwave & walk-in pantry-patio off kitchen offers exceptional privacy perfect for entertaining & viewing wildlife - Master bedroom retreat w/spa-like master bath & generous closet space - Walkout basement w/tons of natural light, 3 more bedrooms & second family rm-Zoned for horses-Minutes away from Castle R, DTC & Colo Spgs -Pride of Ownership Throughout! Luxury Main Floor Living at its Finest!